Happy Saturday to you! 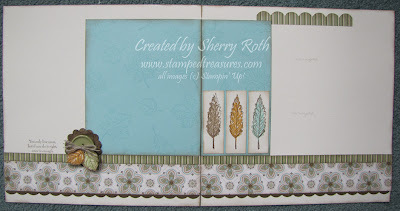 Last night I had my intro to scrapbooking class. I LOVE to scrapbook so I was happy to share what I've learned and some tips and tricks with this group of ladies. After discussing all the different elements to scrapbooking, I had a few layouts for them to make. The one I'm sharing with you today uses the glorious Spice Cake products from the Holiday Mini - I can't say it enough - I LOVE this dsp. I kept the layouts very simple. The top scallop piece on the right page looks kind of funny as it is but once a couple 4x6 photos are added, it will look like it belongs. I plan on taking my kids out to play in the leaves when they start to change and snap some photos for this layout! Not really the best way to scrapbook but fall is my favorite season so all my fall photos have already been scrapbooked!